New Product Pricing! We have reduced our prices on smalti and stone to reflect a cheaper Euro. Most of our smalti colors have been priced at $11.98 per half pound. This new pricing reduces the price to $10.96 per half pound. This discount is applied automatically. If you have a coupon discount you can also use this during checkout for further savings. Normal - also referred to as "A" cut, the traditional cut for smalti. Ravenna - also referred to as "B" cut, larger, irregular shapes that can add amazing color to your contemporary mosaic project. Pizzas - where all smalti begins. 12-13" plates that can be cut or broken to any shape you would like. Click here to see our wide variety of smalti color mixes. Do you have a Pantone color formula guide? Click here to download our cross-reference of all di Mosaico colors to the Solid Coated guide. Questions about smalti? Click here. How big are the smalti pieces? How do I cut smalti to the size I need? How much smalti will I need? How many pieces of smalti are in a half pound? Where can smalti be used? How do I fasten smalti to my mosaic? What are the different methods for creating mosaics? Which side of a smalti piece is up? Does smalti in a mosaic need to be grouted? Will I need to polish smalti? How do I select the colors of smalti I need? Who makes di Mosaico's smalti? What's the difference between MDM smalti and other brands? How do I select smalti if I have an old sample board from di Mosaico or from another manufacturer? Can I get smalti in other colors? Can I get smalti in other sizes? Why don't I see purple smalti? The normal cut of smalti is about 5/8" long x 3/8" wide x 1/4" thick. Because smalti is cut by hand, it varies somewhat in size. Three methods of cutting smalti are most common: nippers, hammer and hardie, or chopping machine. Nippers are pliers with 2 round carbide blades. The piece of smalti is placed between the blades, and a squeeze of the handles fractures the glass. Nippers are easy to use but can tire the hand and forearm muscles. The more traditional method is hammer and hardie. The hardie is a chisel securely fastened in a wood block. The tessera is held atop the hardie and then tapped gently with the hammer to fracture the glass. This technique takes some practice, but is much easier on the hands and arms than nippers. Once mastered, it is usually the preferred method, especially for larger projects. Chopping machines make the hammer and hardie into a production tool that requires only the turn of a handle to fracture the tile. The rule of thumb is 3 pounds of normal cut smalti for one square foot of finished mosaic. 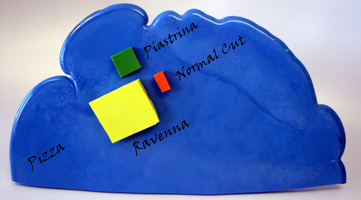 For pizzas and Ravenna cut, plan on 4 pounds of smalti per square foot but this is dependent upon the spacing between your pieces. You will find about 90 to 100 pieces of normal-cut smalti in a half pound. Because di Mosaico offers premium quality smalti, you can use it just about anywhere--indoors, outdoors, walls, floors. You can use adhesives like WeldBond, thinset (mortar), or silicone. The most important thing is to use an adhesive appropriate for your particular location (indoors, outdoors, floor, etc.). The most common methods are direct, indirect, and double reverse. For more information, see the methods page. Traditionally, the riven (fractured) faces are exposed. If you're not doing traditional mosaics, however, you can choose differently. One wonderful artwork selected for the 2006 SAMA juried exhibition had smalti standing on end. The irregular surfaces and air bubbles in smalti make grouting difficult. Traditionally, smalti in mosaics were positioned very tightly and not grouted. For floor applications, smalti can be ground and polished to make a smooth surface. If some irregularity is acceptable but you want a fairly smooth surface, you might consider using an indirect method. Selecting colors directly from a sample board of smalti is by far the best method. It's impossible to capture the brilliance of smalti colors in print or on the computer screen. Di Mosaico is the exclusive distributor of smalti made by Mosaici Donà Murano (MDM). MDM is owned and operated by Stefano Donà, a third-generation glass artisan in Murano, Italy. At MDM, the first step is to mix sand, soda, lime, and coloring and opacifying oxides according to secret recipes handed down through 3 generations of the Donà family. The powder mixture is fused in the furnace at temperatures up to 1450º F and then poured out into a press creating round "pizzas" about 15" in diameter and 3/8" thick. After slowly cooling to room temperature, the pizzas are first cut with a glazier's diamond and then broken into smaller and smaller pieces. The final step in making normal-cut smalti is to cut smalti strings (about 3" long x 5/8" wide x 3/8" thick) into the final size with a hand-operated chopping machine. The first difference is the size of the palette. MDM has 291 standard colors so you can incorporate more nuanced color shading into your work, enabling you to really paint with glass. A second difference is the appearance of the tile. Smalti has different grades of ingredients, and overall MDM is produced to a higher grade than other brands. This wouldn't matter if you couldn't tell the difference in appearance, but I think it is obvious if you know what to look for: higher-quality smalti has fewer air bubbles and a higher sheen (a glossy, not pasty, look). MDM produces smalti that can be matched to nearly all the colors on the sample boards from Series I and Series II (Orsoni). If you are interested in these colors, please contact di Mosaico. Yes, the standard palette for MDM smalti contains 291 colors, but the MDM recipe book includes thousands more colors. For shades of color in between those in the standard palette, or for custom colors, please contact di Mosaico and we can make a special order. Yes, just about any size can be special-ordered, from smaller than normal cut to entire pizzas. The smalti color depends on the oxides in the recipe. Oxides for blues and greens are readily available, but reds are difficult and deep purples have been impossible for makers of traditional smalti. Although smalti is glass, it is not likely to cause cuts. Smalti is not brittle like stained glass, which breaks easily into hazardous shards. In packaging orders, I usually grab handfuls of smalti with my bare hands, and I've never been cut. In fact, I know that kids enjoy playing with smalti like building blocks. That's not to say that you couldn't hurt yourself with solid pieces of smalti, but the only ways that I know of are to take a really pointed piece of smalti and intentionally push it into skin, or to mishandle a very heavy box. The other potential hazard is dust. Fine airborne dust is especially problematic, so always wear a mask and eye protection when grinding smalti. The dust created by nippers or hammer and hardie is larger, so be sure to wear goggles to protect your eyes from flying pieces, and a mask is also a good precaution.